From April – November, Have Your Soil Tested At No Charge: Click here to learn how! Soil testing is the only accurate way to know if you should add nutrients to your lawn or garden. Healthy soil is the foundation of successful gardening. The first step to cultivating healthy soil is having your soil tested. Collecting soil samples only takes a few minutes and has many benefits. It can help you save money in your lawn, garden and landscape, can result in healthier plants by telling you which nutrients are already in your soil and which you need to add, and can protect water quality by preventing unnecessary fertilizer applications. What Will Soil Testing Tell Me About My Soil? One of the most important things the soil test measures is soil pH, or how acidic or basic your soil is. Soil pH levels in North Carolina range anywhere from 3.5 (very acidic) to 8.0 (basic) or higher. Most ornamental plants, vegetables, fruits, and lawns prefer to grow in soils where the pH is 5.5 to 6.5, though acid loving plants such as azaleas, camellias, gardenias, loropetalum, and blueberries prefer a soil pH between 5.0 and 5.5. Soil testing is the only way to know if your soil is too acidic, if you need to add lime to raise pH, and if so how much. Many people apply lime unnecessarily, which can raise soil pH too high, resulting in poor plant growth. Soil test results will also tell you which nutrients you need to apply for the type of plants you are growing. If nutrients are needed, they can be supplied with either natural (organic) or synthetic fertilizers. Soil test results will not determine if there are diseases or herbicide residues in your soil, or if poor drainage or soil compaction are causing plant problems. If you suspect these issues contact your local Cooperative Extension office for advice. Submit samples for planting and gardening projects several weeks before you plan to plant. This will allow plenty of time for you to get the results back and amend the soil before planting. Soil samples can be submitted for testing any time of the year. Results are usually ready within a few weeks and are posted online. Winter and spring are the lab’s busiest seasons. Samples submitted during these times may take longer to process. Click here to check current processing times. Boxes and forms for sampling are available from any Cooperative Extension center (click here to find your local center). Completed samples should be mailed to the N.C. Department of Agriculture’s soil testing lab in Raleigh, whose address can be found on the soil sample box and submission form. Click here to download a submission form for home lawn and garden samples. Samples submitted between April 1 and the end of November are analyzed free of charge. North Carolina is one of the few states to offer soil testing at no direct cost to its residents most of the year because of funding derived from a statewide fee on commercial fertilizer. A peak season fee of $4 per sample is charged for each sample submitted between December 1 and March 31. Collect several random samples from each area of your yard where different types of plants are growing. 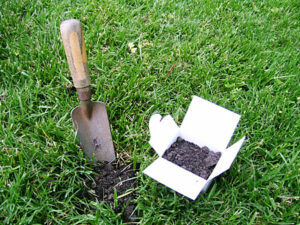 To have your soil tested, collect samples from different areas of your yard. 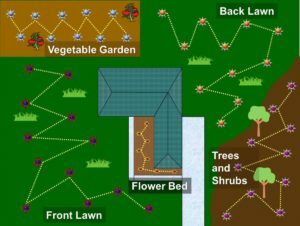 You will need to randomly collect several samples from each section of your yard where you are growing something different; for example, collect several random samples from your lawn, several samples from your vegetable garden, etc. Samples should be collected with a stainless steel trowel and need to be taken around 6” deep. For each sample you submit (example – lawn, garden, flower bed), aim to collect a total of about a cup and a half of soil when the random samples are mixed together. If there are areas in your yard where plants are not growing well be sure to sample them separately to find out if the problem is nutrient or pH related. Detailed instructions on how to collect and submit soil samples are provided in a presentation from NCDA (click here to download the presentation as a PDF file) and in this brochure (click here to download). For a demonstration on collecting soil samples, see this video from NC State Extension. When complete, your results will be sent to you by email (look for a message from AGRONOMIC LIMS) as well as posted online at http://www.ncagr.gov/agronomi/pals/. For help reading the soil test results, see this one page guide or contact your local Extension center. A detailed publication on the soil test report is available, click here to download.